If you want to be consistently successful on western big game there are two ways to get there. The first is to buy your way in to opportunities. With a big enough bank account, all of your 400-inch bull elk dreams can come true. For those of us with more modest means, the answer comes from work. Old-fashioned, one-foot-in-front-of-the-other work. This goes for elk, of course. But also applies equally to antelope, mule deer, western whitetails, and the limited-tag high-country dwellers that we might pursue once or twice in our entire lives. Getting to where they live, whatever they are, is the most important step in the process. This might be aided by horses at some point, but eventually you'll have to slide from the saddle and shoulder the weight of your pack all on your own. For this to be as misery-free as possible, you'll need to consider a few things. Trekking poles are all of the rage in the mountain hunting world these days. They can turn you from an awkward bi-ped to a somewhat less awkward bionic four-legger. You'll want the right base layers and outer layers to keep you comfortable throughout an all-day hunt that could go from sedentary to full-on exertion and back several times. And you'll need to think about your feet. Quality boots matter â€” a lot. Anyone who has hiked a few miles in poorly designed boots knows this all too well. Quite a few years ago I had a mule deer hunt go south in a hurry because the boots I was wearing wore holes into my heels. I had to cover open wounds with duct tape and carry on, but believe me when I say that it wasn't much fun. Great boots for western hunting have to be designed to handle all types of terrain, which was the impetus behind the Alsea from Danner. These boots are designed with full-grain leather and a rugged, GORE-TEX®-lined upper to keep your feet dry and comfortable. They are 100-percent waterproof, yet breathable and are built to keep you upright no matter how rugged the conditions are in which you choose to traverse. This is made possible through an outsole that is outfitted with large perimeter lugs, which essentially promote extra surface contact which translates directly to better traction in all environments. The eight-inch Alsea are offered in several versions, including non-insulated and insulated options. The non-insulated boots tip the scales at 51 ounces per pair, which means they are ideal for mountain hunts where every ounce matters. A newbie mistake in the big vistas of the west is to spot an animal or a tasty looking mountain basin and decide to go from point A to B. This works on the plains for antelope (sometimes), but is usually a fool's bet in the mountains. A savvy western hunter will find an animal or a likely looking draw, and then dissect the mountainside to pick a route that allows for a couple of things. The first is that it will give you the opportunity to sneak close without getting spotted or winded. If either happens, it's game over. The second is that the route will allow for the most ground traveled with the lowest energy output possible. Anyone who has spent a few days in the mountains knows how important this is. There is nothing worse than climbing to a spot, only to realize you've been cliffed out and have to backtrack. Going up is one thing, going back down in order to go back up later is far, far worse. Plan your routes carefully and remember that in most cases, you've got more time than you think. A herd of elk browsing away at timberline isn't likely to suddenly light out across a hogsback into a different basin just on a whim. Go slow, go steady, and go as efficiently as possible. Let's say you're plying the sandhills for a mule deer and you spot a great buck working his way along a coulee. His direction matters, as does yours. The general rule is to try not to follow any game animal because you usually won't catch up, and if you do, you'll usually get busted. Head him off if at all possible, which might mean that your lazy day of crawling has now turned into the kind of endeavor where you need to dip behind the nearest ridge to jog your way a mile closer before slowing down. In a different scenario, you might spot your antlered prize bedded down with no intention of going anywhere. He's secure in the topmost edge of a mountain basin watching the whole world below him. You'll want to make a move, obviously, but in this case you'll want to avoid getting in front of him. In fact, you'll want to get around and above, which means it's time to climb. High-country critters don't often face predators that approach from above, so that's where you need to be. This means that after three hours of glassing and sitting on your haunches, you'll suddenly have to go into full-on rock climber mode. With either scenario, and countless more, you have to be prepared to go up, down, fast or slow as the situation dictates. 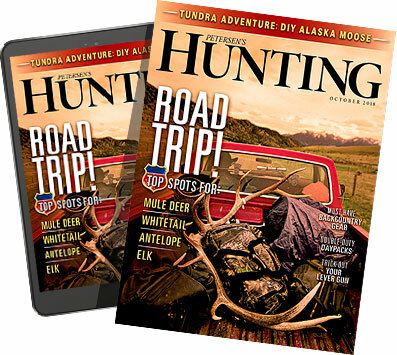 If you're planning to cover some serious ground in search of western hunting adventure, go at it the right away. Plan to work hard, hunt smart, and outfit yourself with the gear that will get you there comfortably.